Margaret’s ‘Secret Garden’ quilt was made mainly while she was on a quilt retreat and incorporated two techniques that she was keen to practise; trapunto and free motion quilting. She talks about downloading the pattern and purchasing fabrics online for the project, as well as describing in detail the techniques used in making the quilt. Later Margaret tells how she got into quilting beginning with a quilt for her dog and a search for a quilt group. 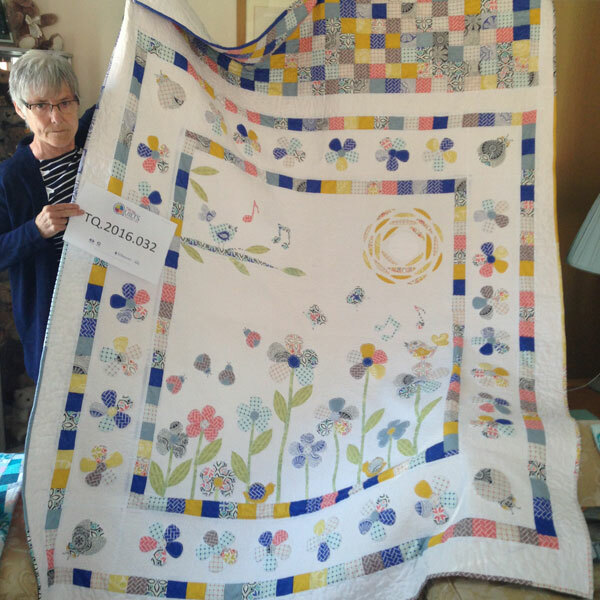 She also talks about how she views quilts that are exhibited and the sense of achievement she gets from quilting. Diane Byrne [DB]: ID Number TQ.2016.032. Name of interviewee: Margaret Curtis. Name of interviewer: Diane Byrne. Location: Diane Burn’s home. 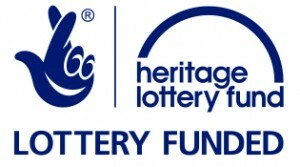 Address: Shirley, Solihull, West Midlands. The date: 6th June 2016. Thank you for agreeing to this interview, Margaret, and, um, could I ask you to tell us about your touchstone? Margaret Curtis [MC]: Yes. 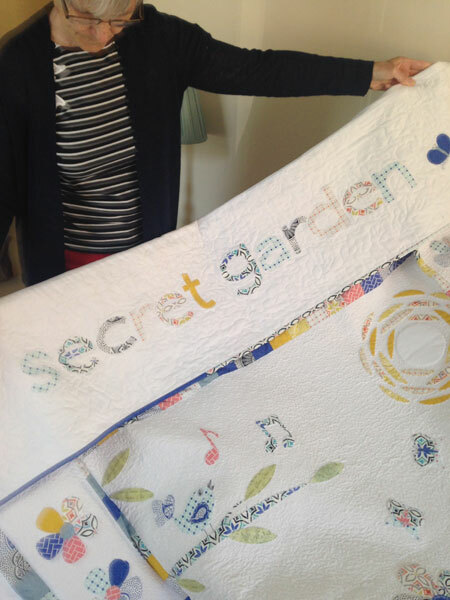 I’m going to tell you about, um, my quilt that I’ve recently finished and it’s, um, called Secret Garden. That’s not my name for the quilt; that’s the actual quilt’s name on the pattern that I found. So I signed up for, um, a retreat in Norfolk, and I was looking for a project to take with me. I had, um, several, um, smaller projects that I thought I probably would choose from, and then, um, another lady that was going on the retreat said I should be looking for something challenging because I’ve got, um, a long period of time to sit and work at it. So I went back onto the computer and started looking through. And I was on the Craftsy website and I came across, um, a column on the right hand side where they, they give you names of different quilts to look, look at, and one of them was, um, a trapunto quilt and I didn’t know what trapunto was. Um, so I looked onto that one and as soon as I saw the actual photograph on the website of the completed quilt that sort of struck a chord and I though, ooh yes, I like that, primarily I think because it was a white quilt and this one was done in, um, primary, it was all primary colours, and it just looked, um, really eye catching. So I had a look at it to see what the trapunto was and, um, then I thought right, yes, I’ll do that. Firstly it’s trapunto and I’ve not done that. Secondly it was lots of applique, and although I’ve done hand applique on the Baltimore quilt that we did in the group, I’d never really done machine applique, um, on a project. So I downloaded the pattern and that was it really. I didn’t look back from there. It was then a case of, um, looking at what I needed. I’d decided, although it looked really stunning in the primary colours, I’d been given, um, a jelly roll, um, as a Christmas gift and, um, my intention was to use the jelly roll, um, rather than, um, source different fabrics. Um, so I really started from there with it. I, I downloaded the pattern and I looked at all the requirements I needed. I’ve sent for, um, all the materials; some of the things were different things I’d not used before but, um, only like the, the things you put on the back of the applique, different kinds. So it was, um, a bit different in many ways sort of resourcing the stuff. Um, having resourced the materials, I was then looking at the pattern and I thought, crikey [laughs], I don’t think even a week’s retreat is going to be long enough, um, to get it done, although I didn’t have to finish it on the retreat. Um, but then the other side of me that likes to get things started and get on with things, I started fiddling around, um, cutting bits. So I ended up, um, cutting, doing all the cutting out, um, in advance and bagged it all up in its little b, little bags, there was these little areas. And, um, then I sort of put it away and thought well that’s that until the retreat, and then a bit later on I thought, oh no, I’ve not really done all these letters. The Secret Garden was letters and, um, I thought, ooh, I’ve not used that backing before. So I thought, ooh, I’ll just applique those letters onto the fabric so I then put the letters on, um, to see how that worked, and, um, disciplined myself to leave it. I didn’t stitch those, I just stuck them on, ironed them on. Um, and then I had another little phase where I thought, ‘oh, all these squares’, the border at the top, which on the correct side which folds underneath, um, when you’ve got it on the bed, is made up of, um, 2 ½ inch blocks. Um, and there’s one, two, three, four, five, six, seven, eight strips of the 2 ½ inch blocks, inch blocks, so I thought well that’s going to take a bit of time, and it did. Because I joined all the blocks together and then I thought I could do, um, the quick jelly roll method where you fold it over and stitch it, cut the end, fold it over, stitch it, cut the end. Um, but that wasn’t that simple because although I thought I’d cut out my 2 ½ inch squares meticulously, my seams didn’t match up. So I had a look and I thought well I’d get away with that, but nah, I couldn’t get away with it really. So I had to unpick quite a few bits of it and operate on them, as I call it, to get them all lined up. So I made that panel before I went as well on the retreat. Um, that was it then. I did pack it away until the retreat time and, um, started putting the… worked on the centre panel first, which is what the instructions said on the pattern. So I did the centre panel first. Um, but my main concern was I couldn’t see how the trapunto was going to be trapunto. I couldn’t see how when I put it together, that little bit of wadding that was behind it, ’cause it wasn’t the traditional trap, trapunto where you stuff it with the filling, um, and I couldn’t see how it was going to have a profile to it. Um, however, I continued and, um, got that panel put together. And, um, the pattern, you put the whole quilt together, um, before you actually sandwiched it and quilted it, but I wasn’t confident with getting the size of the quilt under my machine to do the free motion quilting. So I actually did, um, the centre panel and did, um, quilt-as-you-go, I, I, added my other panels on, um, and I found that much simpler to manage because the outer panels that were, um, free motion quilted I only had to put the outer edge under the machine, I didn’t have to put the whole quilt through it. I just turned it round and did each edge, um, separately. Um, on the retreat I got as far as doing the completing on all but about six inch square of the free motion quilting on the centre panel. That was hard going, very hard going. Um, I think for everybody’s ears as well ’cause my machine was quite noisy compared to everybody else’s. It was just non-stop drrrone of my machine. And then somebody suggested doing 20 minutes and having a rest [laughs]. So I did. And that worked better ’cause It was, that was really hard work, even with my new gloves you see. I’ve got new gloves as well, ’cause somebody said about gloves on the retreat. So I have my machining gloves and my 20 minute spell and that worked a lot better, and I did that when I was at home as well in order to do the rest of it. The free motion quilting which I did in the middle, it said to do, um, a small design, so I did, um, I think vermicelli as it’s proper, I don’t know if it’s proper names on the quilting thing, is it? I just call it, um, just the squiggles really, but, um, and I did it really tight. And having done that the profiling works on the, um, trapunto; it stands out. Um, the… borders round… have, having done centre panel you then do a frame round it with the, um, same fabric as you’ve done the blocks in, the 2 ½ inch blocks. Um, on the pattern they were longer pieces, but I wanted to, um, keep the same dimensions to it. So I did the 2 ½ inch blocks, er, to make long strips to do a frame round the centre panel. And then the next panel has got the flower, flowers on it and bugs in the corners. And then there’s another strip of, um, the coloured blocks. And then there’s a white band. I free motioned that white band, um, in a much slacker, um, because I didn’t want that [noise in background] as tight because I wanted to separate that out from, er, where the trapunto was. Um, and to bind it, um, the pattern again used one colour to bind it, but I joined much longer lengths of the jelly rolls. Well, I literally took what, what was left in jelly roll lengths and just joined them together regardless of how long they were. Um, so that’s pretty random round the edge. Um, and I think that just about completed it. DB: Right. Um, you, you mentioned trapunto. Could you explain that a little bit further for us? MC: Well, as I understand it, in its original [aircraft noise in background] form it was, um, Italian. It was, it came about in Italy; that’s how they quilted in Italy with a trapunto technique. But I believe the original technique and possibly one that people still do today as a choice is you put your applique on but you leave a small opening and then you put, um, trapunto filler which is probably what we would call toy filler now. Um, you push that in and then you complete your, um, applique stitching. And the method on the, um, pattern that I had was you had, um, a piece of wadding but different to the normal wadding, and you put that behind. So you put your applique onto the correct side of your fabric. You then put the, um, app, um, the wadding special wadding underneath it and it said to iron it on but I didn’t bother ironing it on because it, it, the pieces I cut, I cut just larger than the applique and held them in the middle with a pin and that was fine. 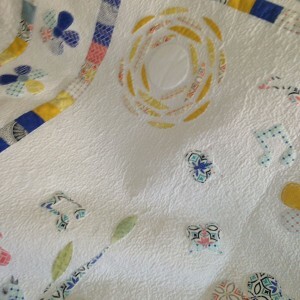 Then you applique round your motif and then turn your fabric over and trim away the extra on the outside. And it doesn’t look as if it’s gonna be a profile at all, but when you’ve then got your wadding and then your backing fabric [bleeping noise in background] and then you do your, um, free motion quilting round, round your, um, motif, then you do get that raised impression. DB: You also mentioned a jelly roll. DB: Could you explain what a jelly roll is please? MC: It’s, um, long strips of fabric. Um, my strips were, I believe, 2 ½ inch width. And it’s, um, a readymade roll of, um, fabrics that somebody puts together, coordinating fabrics, and I think there’s, um, probably two of each colour or two of each design in each roll. And I really can’t remember how many rolls there were. But my instructions said, um, two jelly rolls. Well, I had one jelly roll so I purchased another one in the same. It was, I can’t remember, it will come back to me in a minute, but, um, Lewis, the… somebody in Lewis fabrics. And, um, I managed to get another one, um, with difficulty, having looked online. And, um, then I needed some, um, charm packs. I needed some, um… because for some of the applique you needed larger pieces of fabric and when I went online it was the Irene Lewis, um, range, I couldn’t find a charm pack in the design of my fabrics. So I got, um, sent for two or three, um, fat quarters and, um, managed with that. Um, that was ample. DB: Great. You also, you also mentioned free motion quilting. Could you explain what free motion quilting is please? MC: Um, free motion quilting is, um, well as I see it, you do your own thing really. Um, you use, um, my machine I drop my dog feeds and I use, um, a darning foot which has got like a horseshoe end, an open circle end at the bottom which allows your needle to, um, jump around more freely. And you just, um, move your fabric around [phone noise] underneath your machine to make the shapes or the designs that you want to do. Um, that’s something I started doing maybe six months ago the first time I did it, and I did something quite sort of open and, um, sort of relatively simple and if you went out of line it wouldn’t matter. And I quite fancied the challenge of, of doing more of it and, um, trying different, um, different designs. So I did make a quilt, um, from a textbook, um, pattern, a modern heri, it’s called a Modern Heirloom quilt, where you, the idea is that on the outer panels you do free motion. So I used that quilt to do, I think I did 12 different, um, free motion designs on that one. Um, you can buy, um, templates I believe, and you can set your machine up so you can work through the template or around it. I don’t know how that works, I’ve not done that. And you can draw it on. I’ve not drawn anything on yet, although if I want to do something more, um, different, more advanced, I think I might have to get to the stage where I need to draw a design on first. I don’t know about that. I’ll have to experiment with that. DB: Um, you, you mentioned a profile when you were talking. Could you sort of elaborate on that? MC: Er, the profile. Yeah, that’s my terminology for, um, making the… on the trapunto, for the, the, er, motif that you’ve appliqued on for it to stand up and be proud, be proud of the quilt. Um, so yeah that, I use that for, I’ve used the term profile in order to lift, yeah, that’s my description for lifting it off the quilt as it were. DB: Thank you. Um, what sort of gloves do you use? MC: Um, I don’t what they’re, um… On the retreat a lady said did I want to borrow hers, and I said, ‘oh no, it’s okay thank you’. And then she said, ‘no, go on, try them, ’cause you’ll find it a lot easier’. So, um, they were cotton I think and little rubber bits, a bit like gardening gloves with little rubber bits on the palm side on the fingers. Um, and then she went off to the shops so I asked her if she would buy me a pair. When she came back she’d bought herself a new pair and gave me her new ones that she’d already lent to me, so they’re very special gloves those. DB: So what are the gloves used for? MC: Um, so they enable you to push the fabric through, um, the machine better. There’s a better grip on your hand. It’s, it, it is really much better because when you’re using your hand, you use… you can push the fabric through but it’s a lot more strenuous and it makes your shoulders ache a lot more ’cause you’re having to put a lot of pressure on and your muscles are tense all the time doing it. Whereas when you’ve got the gloves on, they, they sort of had that grip and then you’re not using as much muscle tension to push them through. DB: Is this for general sewing? MC: I don’t think… well, I’ve only used it for the, the free motion. I don’t think you would need them for, um, general sewing. DB: Thank you. Um, how do you plan to use your quilt? MC: Well I had no specific plans for it. When I saw it I thought it’s probably perfect for a little girl’s, um, bedroom. Don’t have any little girls and so I really had an open mind as to what I would do with it. Having completed it, um, I think the lady’s pattern I used, I think she was probably American because the bed size quoted was for, um, a single bed, and this one I’ve done exactly to the dimensions and it actually fits on a double bed with overhang. So it sits very proudly I have to say on our spare bed at the moment, um, and I’m keeping it [laughs]. It’s not going anywhere. DB: How does it make you feel? MC: Oh, I love it. It makes me, yeah. No, it makes me feel very good. I, I generally walk past the room and walk in and give it a little stroke or a little pat. Um, yeah, no, I, it… I achieved a, a lot of the things I wanted to achieve, well everything that I wanted to achieve really. I’d, I’d done the machine applique, um, which I hadn’t, as I say I hadn’t really done before. I didn’t think it would be particular difficult but it’s just something I hadn’t, I hadn’t done. Um, it gave me the opportunity to, um, re-arrange everything and lay it out as I wanted it in terms of, um, of grouping things together rather than doing things… I thought at first I’d do everything random with it, just pick bits up and put them together, but then I wasn’t easy with that. Some bits lent to random and, um, some of the flowers, it’s, the centre panel has got, um, flowers on with flower heads with five petals and then stems and leaves, and there’s various heights of flowers, and I decided the smallest flowers I would do in self colour. So all the petals are the same colours on the smaller flowers and then I’ve done random colours on the, um, on the larger flowers. And, um, likewise with my bugs, there’s bugs in the corners, like lady… on the pattern on the internet they were more like a ladybird because she’d used cranberry colours and she’d done them in red so they looked more like ladybirds. Um, but I’ve tried to coordinate those as well so it, it gave me that opportunity, because I like to do random but I like to have a bit more control over what I’m doing sometimes and, and, and sort of put more thought into it. DB: Thank you. When did you first start making quilts? MC: I think it was about four, four years ago when I made my first one. My first one I made because I had bought, um, I picked up from Hobbycraft a long time ago now, about probably eight years ago, um, fabric that was, um, cushion cover fabric. So it was a panel with, it had Labradors, a black Labrador on it, so it was a, it was… the fabric was a panel with a Labrador at the top and a Labrador at the bottom and you folded it in half and stitched round and made a cushion cover. That was what the panel was sold as. And I picked up two of those because we’ve got a black Labrador and I thought, ‘ooh, I’ll just make some cushions to go in the conservatory’. And, um, I never ever got round to making cushions to go in the conservatory ’cause we never seemed to sit in it. We had children’s toys or anything in it but we never really sat in it, so I never got round to doing it. And then when I was tidying out I came across these fabrics and I thought, ooh, I’ll do a quilt for Peggy because she’s starting to climb up on the furniture. So I thought I’d do a quilt so if she went on the furniture she went on her quilt. Um, so I bought a basic, um, a teach yourself to quilt book and, um, I used one in there, um, and I used the… I cut the panels smaller so there was just the, the Labrador was the patchwork square and the outer bits of the fabric I used in the quilt and I bought, it was, I bought I think four different coloured fabrics that went with the rest of the colours that were in the, in the piece I’d bought, the pieces I’d bought. And I, I did, um, a design which was lots of triangles. Um, got it put together and it had several imperfections. However, I thought, ‘ooh, I’ll be a bit clever here and I’ll do the back but I’ll do the back in, um, in different designs’. So I quilted a design on the back that I’d made up as I went along, my own design, which again had several imperfections. However, I, er, sandwiched it together and I, I just did, um, basic, um, it is stich-in-the-ditch but I didn’t know it was stitch-in-the-ditch, I just stitched along the seams as I called it then. And, um, it’s actually stood the test of time. It never went on the furniture because she got naughty so we didn’t let her go on furniture, but it’s always been in the boot of the car. So, that was my very first quilt. But having done that, that whet my appetite ’cause I though, ooh, I’ve enjoyed that but I’d like to know how to do things and to do things properly and not just botch it together. And I thought it would be quite a nice thing to find a group for because we’d moved areas and I didn’t really know anybody. We didn’t have grandchildren then so I wasn’t sort of chasing around doing stuff for them. Um, and I tried to find a group locally but there were groups in Derbyshire but too far away really to, um, fit in with the rest of the things that needed doing in the daytime. And, um, then when I was looking after Henry, um, I had him out in the pram. I’d been to the library in Shirley and for some unknown reason, it must be fate, I crossed the road, I didn’t need to cross the road. Came out of the library and I crossed the road and I was reading the notice board at the Institute and saw the, an advert for the Stitch-in-the-Ditch Quilters Group. So I sent an email off explaining I wasn’t local and dah-di-dah-di-dah, and there I ended up. DB: Have you a preferred style or technique of quilting? MC: Um, I don’t think I’ve done enough to have a true preference yet, um, because from the projects we do within the group there’s always a variation as well. So, if I didn’t want to do, for example, if I didn’t want to do any hand stitching, I’d have to not do some of the projects. So it, I, I, it makes you do both anyway. Um, I don’t, I don’t mind because there’s, um, I like to get things done and I like to get them finished, and I don’t mean that I like to sort of set a time thing, so I’m starting it this week I need to finish it next week. I’m, I’m, don’t mean it like that. But I don’t like to have lots of things on the go. I do like to complete something. So using the machine enables that to happen more quickly. Um, but there are occasions when the, the hand stitching is better. It fits in… last summer I took it away, I took hand, hand, um, hexagons away with me to do when we were holiday all the time ’cause hand stitching, and I really enjoyed doing that. Um, the hand quilting is quite, is something I’d quite like, um, to do a bit more of, but I’m doing that now on the, on the block of the month project that we’re doing. It’s not a lot of quilting on each block but it is some and that’s getting better with each block, although there, it’s only a small amount. Um, but when ladies bring in something they’ve hand quilted the whole thing and I think that’s quite amazing. But I don’t know whether I could do that in a whole, on a whole quilt because it’d take too long I think, ’cause I understand it’s something that you can, it does take, there’s longevity to it. It’s not something you’re gonna finish, you might need a year to do it ’cause you can’t sit for hours doing that, can you, I don’t think compared to being on the machine. But I don’t… no, I like to try a bit of everything I think. DB: How much time do you spend making? MC: Not as much as some people think. I do, um, I do the, the group on… I do the group, which is the one afternoon, and then that evening, if it’s the block of the month I generally get that almost finished on that evening because I’m sitting at my daughter’s and I’ve nothing to do, so I generally get that finished on that one. And then it’s probably, on a regular basis, a Thursday, I, I might do three or four hours at some point during the day on a Thursday. And then at the moment because we’re back on childcare, um, I dip in every day really. I have a machine set up all the time and I just dip in as and when, um, the time allows [aircraft noise]. But some weeks it might just be the, the Monday and the Thursday. Last year it was different because I wasn’t doing childcare. So every Monday if I wasn’t at the group on a Monday then Monday all day I set aside to quilt. DB: Thank you. Um, you, er, mentioned, um, a retreat. Could you explain what a retreat is please? MC: Yeah. Allegedly, it’s a place where one goes to shut oneself off from the world and gather one’s thoughts. MC: However, there can be a variation on the theme. MC: It was, um, a venue, um, a venue we stayed in in Norfolk, um, which was a mixture of, it was a holiday place so it was, um, used for other, um, holiday times as well. Um, but they were experimenting I think, um, and I’m guessing it’s probably been a success, on, um, doing quilting weeks, retreat weeks or days. And, um, you go off and you literally can just quilt from when you get up to when you go to bed, if you want to. Um, the facility was set up with a workroom where there were stations, enough for eight, eight people to be in there at one time, and apart from your sewing machine which was, I think you could, if you needed a sewing machine I think one might have been provided, but, um, you took your sewing machine and you took your personal requirements for your project, but, um, everything else was laid out there for you. And we were fed and watered, and, um, yeah, we just got on and everybody had a project to do and got on with it. DB: Sounds fun. Um, what do you look for or notice in other quilts? MC: Um… If I’m at, if I’m at, um, one of the shows where the, the sort of quilts are to be in competitions and things, if they’re hanging and looking at those, then I’m probably looking at the intricacy of, of what they, what they’ve done that I’ve not done. Um, how have they done that? And then you’re looking in awe at them because they’re absolutely… some of them come up with absolutely amazing ideas. Um, if I’m looking at, um, work that other people bring from the group then really you’re just looking at appreciation of what somebody else has, has done and you’re not looking at, um… Like if you’re at a show you might look at something and think, ooh, that’s won a prize, ooh, look at that, and, and you’re trying, you’re not deliberately looking for faults or imperfections, but you’re, I guess you’re looking thinking, well, is any quilt perfect, if you know what I mean. You under, yeah. Um, but when you’re looking at other people’s work when they bring it in from the group, then you, well I certainly am not looking with a critical eye what anybody else has done. I wouldn’t dream of looking at somebody else’s quilt and think, ooh, well that doesn’t look quite straight or that isn’t joined up. It’s always an appreciation of what, what the person has achieved. And you’re looking for a bit of inspiration as well a lot of times ’cause it gives you an idea. Ooh, I never thought of, I never thought of doing it that way. And, um, yeah, you, you get something, you get something back from everything that you look at if, if you’re looking at it with open eyes, which is what you should be really. Otherwise there’s little point in looking at anybody else’s work if you don’t want to take something away from it, I don’t think. DB: Thank you. Um, perhaps one last question. 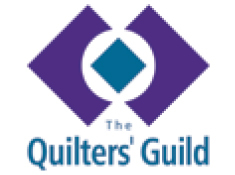 Why is quilt making important to you? MC: Um… I don’t know if important is probably, um, the right word but for me it gives me, um, a massive sense of achievement. Um, it opens avenues for meeting other people, without a shadow of a doubt, and sharing ideas. And then when, when you get to know people through the quilt bit and you’re doing that, you get to know other aspects of people as well, which is important, so you’re seeing other people as whole people, not just people who are sitting producing, um, a quilt. Um, but the, the quilting for me at the moment, um, it, at the moment it gives me a drive to achieve new things because I’ve all my working career it’s been about, you know, getting kids to aspire to what they can be. And when you’re doing something like this, it gives you a chance on the other end, when you’re not doing that anymore, to try to aspire to achieve things that you’ve not achieved before. Um, so for me it’s like the free motion quilting is something I want to do. And then there’s the Pauline Innocent project which is the new challenge, and it’s just to try to aspire and achieve, um, ’cause that’s what you’ve got to do in life. You’ve got to try and achieve things all the time. They don’t have to be hard, difficult things, but just little achievements for self-esteem really. DB: Right, thank you very much, er, Margaret. That concludes our interview. Thank you for taking part. MC: Thank you for asking me.